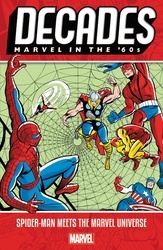 Marvel Comics is celebrating 80 years of awesome adventures with their new Decades series. Each volume gathers vintage comics that focus on iconic moments and characters from a specific era. For the sixties, Marvel has collected the coolest crossovers between their biggest heroes and your friendly neighborhood Spider-Man. The ever-sociable wall-crawler helped build the connected Marvel Universe we know and love with early team-ups (and tussles) with his fellow legends—beginning with his bid to join the Fantastic Four. This book also presents the beginnings of Spidey's amazing friendships with the Human Torch, Daredevil, and his first run-ins with the Hulk, Avengers, X-Men, Doctor Strange, and more.